A man who tried to swallow heroin after being spotted supplying on the streets of Belfast has been jailed for 10 months. Dwayne Michael Mullan put up to 15 wraps of the drug in his mouth when police detained him earlier this year, prosecutors said. The 32-year-old father of four, from Victoria Street in the city, was also said to have been carrying quantities of Xanax and cannabis at the time. Based on his previous record, a judge described his drug offences as being on a “commercial basis”. 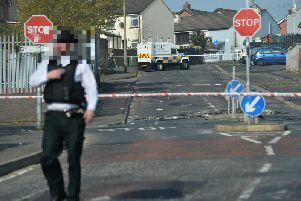 Belfast Magistrates’ Court heard Mullan was observed conducting an exchange with a female in the area of Hamilton Street and Joy Street on April 27. When she was stopped two wraps of heroin were recovered. A Crown lawyer said police managed to keep sight of Mullan and make an approach. He attempted to swallow a small plastic container, refusing to spit it out for officers, the court was told. Eventually it was recovered and found to contain 15 wraps of heroin. Packages of Xanax and cannabis were discovered after he was taken into custody. Mullan admitted possessing class A, B and C drugs, supplying heroin and resisting police. Defence counsel Fintan McAleer stressed no payment was made for the wraps provided. Identifying 11 previous drugs-related offences committed by Mullan, she queried why his latest prosecution was not before the Crown Court. “This is on a commercial basis with a record like that,” Mrs Bagnall said. Imposing six months imprisonment for the supply offence, Mrs Bagnall handed Mullan a further four months for possession the drugs.